Remember the group City High? Well I watched Robby, one of the group members (the one who speaks first in the video), on Intervention this week. Poor guy became a raging alcoholic but at least he accepted treatment. He has been sober since Oct. 09. 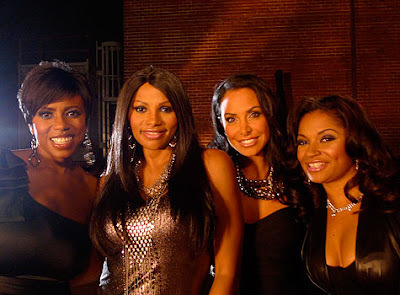 Buppies has come to an end, if Tatyana Ali received good ratings, I'm surre BET will have her back for another season. Did it end the way you thought it would? Everything by Monica is also on my play list. Click here. I know I've been fooled in the past by pretty packaging, how about you? I've purchased products based on it's lovely packaging and description and I am fooled into thinking that the new and improved version will be different from previous versions. In reality it's just the same or very similar product in a new bottle. When I saw the new ShineSensational lip gloss from Maybelline priced at $5.99, I wondered if it could be all that different from other Maybelline glosses. It promises to give you unbelievably shiny lips. This lipgloss is very similar to the Maybelline shinylicious glosses that I reviewed a while ago. It's been on the market for a while, but there is a notable improvement. In the shinylicious glosses there was sometimes a separation of the product and this random gooey gel like oil that would come out of the tube before the actual product. They seem to have nixed the goo this time around because pure product is released with each squeeze. The new sensational lip products have a delicious scent unlike shinylicious. If you pick up a peach flavored gloss you will undoubtedly smell peaches when you open the tube. The packaging is also more attractive with little pictures representing the flavor right on the bottom of each tube. The two flavors that I purchased are Cocoa Fever and Peach Sorbet with mini chocolate bars and juicy peaches pictured on the respective tubes. 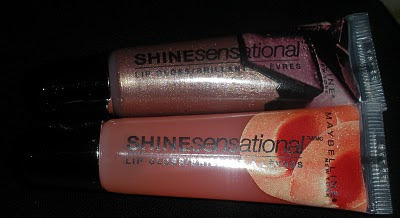 Clearly, if I had to choose between the two Maybelline glosses I would go with the goo free Shinesensational version over the epic fail shinylicious. However, once you get past the goo, there really is no difference in the shine factor. In fact most glosses will give you shine, even the cheaper glosses on the market. In the picture on your left you can see that some of the glosses like the peach one will give you a clear shine while some of the darker shades like cocoa fever, will actually give you a colored tint and shine! While I like the scent and packaging you won't catch me doing any cartwheels over this product. Now I am dying to get my fingers on this candy scented lip quad, the ChocohoLICK by Jane Iredale. Isn't it cute how each gloss is in what looks like a candy wrapper? Priced at $44 this product is supposed to to taste and smell as good as the names would suggest. The favors are truffle, caramel, strawberry cream, and chocolate orange. You can't get these products individually so you must get all 4 goodies. When they are back in stock I'm getting a set. When you break it down it's only $11.00 per gloss which isn't horrible, RIGHT???? lol It's supposed to be a non sticky formula made with nice ingredients like jojoba and sunflower seed oils. 1) umm make the show funny. The jokes are pretty lame, the guy who plays the brother does too muh acting with his eyes. While Tyra may love him for Top Model, he just seems overboard on this show. 2) Shenaynay was another over the top character that could always guarantee a few laughs but her loud mouthed counterpart played by the secretary in Tatyana's show is another wrong move. Shenaynay liked Martin and had a problem with Gina, so as the nosey neighbor including her in scenes seemed appropriate. However, I don't need this fashion victim of a secretary in any scence that does not involve the office. In fact, seeing her tri colored locks in the office is annoying too, so I would just squash that character all together. 3)The Neighbors are toooooo MUCH, pracing around in wierd outfits -just a huge NO. 1) I need someone to be a real friend to Snookie and to tell her to wear garments that flatter her body. I also need that friend to tell her that her happiness shouldn't be based on whether or not she has a fling in her life. 2) I need Ronnie to man up! Sam is a relationship con artist and will always flip the tables on him to get him to apologize for her wrong actions! She is annoying and drama filled. 3)I need Mike and paulie D to keep coming up with catch phrases like the grenade and grenade launcher..lol. 5) I need Vinny to get a personality and stop attacking Mike simply because he has more pzazz. I had forgotten about Vinny's existence until the second to last episode. At the reunion on MTV Sam and Ronnie (aka peanut head) broke up or so they say, I bet they were back together before the producer could yell CUT. I think MTV is gearing up for round 2 but it seems like these Jersey cast mates are trying to renegotiate and get the best deal possible. Word to the wise, don't push it too far you guys, the majority of the cast can be easily replaced. Finally a voice of reason has emerged, Fantasia's oldest brother and background singer (totally forgot his name). He actually has a JOB so he is not a freeloader- HOORAY! He told Fantasia exactly why she is experiencing the problems she is having with family members and what she needs to do to resolve the issue. Although he seems to be her backbone, he is ready to branch off and get a singing career of his own. Remember he is the brother that went with Fantasia to the American Idol audition not just to support her but as a contestant himself so the singing bug is still present in his life. On the other side of town you have Teeny, performing in some venue singing who knows what. I love that he said he doesn't need to ride the coat tails of anyone then the camera showed that he was performing in a venue under this title "Fantaisa's brother- Joe" LOL he is a classic coat tail rider if i've ever seen one. I need Jacque R. to slow her roll. I know you want a baby but the guy she considered for a second was less than desirable...ok at least in my book. If he had been able to hold more than a 5 minute conversation, I think Jacque would have been ok with this guy..oh well to each his own. Pep was with a guy who just hits me a sneaky, but she had her own reservations about dating him because he is a pal to her ex husband Tretch. Jomouna (sp) I can totally do without, between her screechy voice and horrible dating options ughhh. Kittie- I just can't. Why was she emotionally invested in the guy she met online whom she had never seen in person over their 3 year involvement?????? That relationship, I use that word loosely, is an #EPIC fail if I've ever witnessed one. The winner of the giveaway is Blueberry2118. Please send me your address and I will ship out your goods. If I don't hear from you within three days I will be forced to give them away....I'm dramatic lol. Congrats to you and please let me know how it works for you. 1) You can leave a comment (one comment per person please) from now Jan 22- January 24th. 2) The winner will be announced either next week Monday or Tuesday. and a book- it's not really a review but I'm just saying a few words about a book I am currently reading. Last night while eating dinner, I decided to watch the new Tatiana Ali show which I had taped the night before. I think the show has potential but I literally laughed maybe 3 times and all three of those laughs were on shaky ground. I mainly laughed because the joke made me think of something else.... comedy #FAIL. The guy playing Tatiana's brother is corny along with the two corny neighbors who wear odd outfits. The random blond with the exploding chest is a #fail as well. However as I mentioned the show has room for growth and the storyline has potential so you never know where things could go. I did like the episode where her best friend wanted to become more than friends, that episode was a ode to the movie brown Sugar. remember when Taye Diggs' character was going to get married the next day but had an almost moment with Sid played by Sanna Lathan. Ooops there I go again thinking of something else and not being focused on the new sitcoms storyline. I will watch it again shoot I'll probably watch the entire season, maybe it has to grow on me. I hope the show does well. Has anyone been watching Buppies? Honestly I think Tatiana should take over the writing on her new show and make it more like Buppies with a few tweeks here and there and we may have a winner. For those of you who don't know, Buppies is like Friends but except all the characters are black and rich. Why is this chorus stuck in my head?????? "Life is a highway I want to ride it all night long"
I'm wearing Ginger Bells by OPI, in person it is the color of a gingerbread cookie. I paid a little less than the usual asking price by going through Amazon.com. I was picking out a book and ended up with polish too, gotta love Amazon. Did you watch the Tatiana Ali show? I taped it because I was really busy last night, but if you watched it please tell if it was good or not. Don't for get you have two more nights, tonight and tomorrow to catch new episodes of her show. I was devastated to learn that Haiti was hit with another quake and a serious quake at that. Maybelline's XXL Pro 24 HR Bold mascara promises intense bold lashes with volume that will last for 24 hours. I paid the $8.99 price tag and was pleasantly surprised when I discovered that one side of the double tube was not a white primer, instead both sides actually contain real mascara! One side gives you volume while the second tube (labeled #2) features a fatter wand designed to seal it all in to give you 24 hour hold. I can't tell you if this baby really lasts for 24 hours because I have yet to keep it on that long, but I can tell you that it lasts from morning till night without flaking. I am not a person who looks for volume In mascaras I mainly look for length so you may want to take my review with a grain of salt. I think my lashes were volumized but you can judge for yourself from the pics below. One coat from the side marked #1- volumizing side One coat of side 2- this is supposed to make your lashes look bold and last for 24 hours. I should mention that you have to be quick when applying stages 1 and 2 because this formula, like most mascaras, will dry quickly and you don't want to apply stage two on firm lashes. I would get this mascara again simply because I like the length that I get on my lashes with this flake and clump free formula. Have you tried XXl Pro? Fanny's show gave me headache- Teeny is just too lazy and ungrateful. After tearing up her pool house Fanny gave him a budget of $8,000 to get the recording studio built but of course staying withing Fanny's budgetary border was too much to ask of her brother. Teeny ended up spending $40,000 on the studio which showed a blatant disregard for Fanny's rules and wallet. Their mom tried to smooth things over between the siblings when Fanny was upset over the $40,000 price tag. side question-Is the momma slow? She actually told Fantasia it was a misunderstanding huh??? Does Teeny not know the difference between $8,000 and $40,000? Well I bet if Fantasia's well ever runs dry they won't all be so quick to coddle a grown man. I loved the music executive who was not at all moved by Fantasia's attitude and desire to put out a new album pronto. While he supports her next venture he is thinking logically and he wants her record to be right, so I appreciate him. Side note- did anyone else think Teeny's girlfriend looks like his sister? #creepy. (creepy is in reference to his gf looking like his sister not a reference to their actual appearance). Haste makes waste and that single she is pumping her fists for seemed pretty mediocre to me. What did you think of the latest episode? So I guess the weekly setup will always include these four women discussing their dates over lunch... Ummm ok I guess. I hope they at least change the scene to more comfortable surroundings like Peps living room or some place like that. Each week we follow the dates of three of the women. Jomana was off last weeks bench and in the dating game this week as she went out with a professional biker. As he sat at the dinner table raking the dinner fork through his hair, he reminded me to cancel all upcoming restaurant outings that I had planned *gag*. For some reason Jomana didn't seem disturbed by his etiquette or lack of etiquette shall I say. I know she likes a guy with an edge but her man was tacky and lacked the social graces possessed by a house trained orangutan. He later threw his wife beater at a cop van and was nearly arrested but he managed to pull the " hey I'm semi famous" card just in time and he managed to couple it with a whining plea not to be arrested which in my eyes made his bad boy facade crumble. Wild Kittie didn't have a personal date to review this week and Pep didn't either come to think of it. Instead they just went to an after hours club with a writer from Essence mag as they screened the room for cuties. Pep was too nervous to actually approach any guys and in the end all three ladies came up empty. Last but not least my girl Jacque Reed may have rekindled a flame with a man she dated briefly a few months ago. Having pushed what Jacque deemed his selfish qualities aside, he approached her as a new man ready to satisfy some of her relationship needs. Now claiming to be ready for marriage and the baby carriage this man seemed ripe for the picking. However his quick 180 degree change has Jacque scratching her head and wondering if this could all be true. Whether he was serious or just wanted to get a little face time on camera he still scored points in my book for walking off into the night With Jacque instead of leaving her to walk the streets alone like some of the men featured last week. She did seem to have a genuine connection with Jacque so that was refreshing to see. Tatiana Ali new show starts tonight and will air for three consecutive nights on TVone before continuing on it's regular Tuesday night time slot. I can't tell you the name of J'Lo's perfume or the latest scent by Usher because I really don't like perfumes. They are never light enough and I always seem to detect the scent of the alcohol used in the fragrance. I decided to go the natural route by purchasing a splash by Karen's Body Beautiful. Just like her hair products, her fragrances are available in many scents. I decided to try cranberry cocktail because I love the scent of my KBB hair milk in that scent. Sure enough that cranberry cocktail scent did not disappoint me although I did get a whiff of the alcohol included in the product. The SD alcohol is the second ingredient on the list so I'm not surprised that I can smell it in the product. The only issue that I really have is that this product doesn't last as long as I would like it to last on my clothes or skin. Overall this splash is a good effort from the KBB team. I could see myself purchasing another scent in the future. Pearl by Carol's Daughter is a natural based fragrance too but a few squirts will last you alllllllll day long. Check my old review. You can get an 8oz bottle for $14.00. I was on time for my hair appointment last Friday. I walked towards the closet to hang up my coat only to discover a sea of coats squished into the tiny closet space. I walked past the front counter to grab my usual seat. There sat a woman whose face I had never seen before, watching me as I scanned the salon for an empty seat. I eventually had to return to the couch at the front of the salon where no one likes to sit during the winter because of the cool air that seeps in from through door. Just as I was settling into my seat, Lady C calls me to her chair, I was relieved and ready to start the process. We chat it up and I fall asleep intermittently in her warm chair until I am placed under the dryer. When it was all over I loved my hair, got in a few more chuckles with Lady C, tipped her and thanked her for the great service. I marched towards the salon owner allowing my hair to flutter about my face as I handed her my payment. She grabbed my hand and held it as she whispered " you pay lady C now, she's independent". Although the salon had been stacked with new stylist I paid it no mind, I had been getting my hair done either by Lady C or the salon owner for years so the new faces didn't concern me. However, the payment process was new, I always paid the salon owner and tipped whomever had done my hair (either Lady C or the Owner) but this time was different. The owner explained that Lady C now worked for herself and would now rightfully collect her own payments. It was all business to me and I could care less who I paid as long as I left satisfied, but then I was suddenly dragged into the battlefield. Still whispering, the owner said "Lady C buys her own products now so he doesn't have to use what I use. That means we can't share clients anymore because I don't want too many chefs in one kitchen. You have to choose, she said staring into my eyes. I'm sure my face was expressionless as I shook my head for the reminder of the conversation. I was faced with a decision that had to be made, do I now go to Lady C only or the Owner? Lady C is closer in age and we fill each of my hair sessions with random chatter and updates of our lives. I went to her wedding, she's cool and can do hair! The store owner, an older woman with life experiences you could only imagine, would also do my hair and we have had great conversations from religion to politics and business all while making my hair look photo shoot ready. But now instead of prancing over to either or their available seat, I would have to pick between the two and stick with that decision. I left not knowing what I would do and since my next appointment is months away a decision doesn't have to be made now. I like both ladies and they both do my hair well so who do I choose? The young sassy lady versus the mature older owner who doles out her wisdom while combing my tresses in place. So this is my dilemma two women whose salon chairs are just a few feet away from each other expect me to choose! I just imagine sitting in one seat as the other looks at me longingly while preparing the hair of some other client . So that's it ladies, the war between stylists have u ever had to choose? * side note- the new stylists were looking at me as if they thought of me as a potential client. However each new stylist has JACKED up hair...lol I will not be visiting them. Tonight Essence. Com is having a live chat to discuss relationships . Click here to find out how you can join the conversation tonight at 8p. Will you join the conversation? If you have visited the Zoya site, you may have noticed the company Qtica listed. Well I received and email from them offering a free intense treatment lip balm. Simply go to qtica.com and enter the code LIPBALM at checkout. Please note that normal shipping charges will apply at check out. This offer expires: 1/14/2010 11:59 PM ET. Skin MD Naturals -Did it work? If you have dry skin you have likely scoured countless store shelves looking for your bottled cure for dry skin. I know I've tried many products, each time hoping I could scratch of "dry skin" on my list of things I'd rather not have. Product after product failed to deliver the moisturizing goodness I so desire. The people of Skin Md kindly sent me the paraben free Skin MD shielding lotion. It is supposed to improve the hydration of your skin. This product is referred to as the shielding lotion because it is supposed to shield your skin from things that can irritate it, while allowing moisturizing properties to seep through. It also contains chamomile, aloe leaf extract and vitamin E.
The lotion is very creamy and thin in consistency, it is almost feels like water when I apply it to my hands. I should also tell you that this product can be used from your face down to your feet. I have seen some really great reviews of this product, but I had a mixed personal experience. This lotion is said to be so powerful that it is able to help pamper the skin of those who have psoriasis and eczema. Since I don't have such skin ailments I was excited to have possibly identified my winning product. A mysterious dry patch appeared on one of my wrists a few months ago, it's just this one area that is drier than every other inch of skin on my body. Perhaps a chemical burned that area of my wrist, I don't know but whatever it was, that persistent dryness was killing me. If I put lotion on my hands, that area on the back of my wrist would be the first section to become ashy. I applied the Skin MD and I can tell you that the mysterious dry patch is HISTORY. I don't know where it came from but I know that it responded quite well to the Skin MD formula. Although this part of my hand had been cured, every other section of skin on my hands did not respond well to the Skin MD natural lotion. The dry patch was well moisturized while the normal/dry sections were drier than the Sahara dessert. My hands were very ashy. I thought it could possibly be my unique skin so I allowed others to use the product and they received the same results, dry skin. I used the product on my face and I had smooth flake free skin. This product has totally confused me, working for some sections of skin but not others. I guess my search continues. Have you tried Skin MD naturals? So many people have grown tired of reality tv shows but every now and then we are presented with a show with a different twist. Last night Fantasia an American idol winner, allowed us into her world through her new reality show. Fantasia’s show allows us to see what she is going through in her personal life. This young lady is caring for 6 family members. Those looking to fantasia for support include her daughter (obviously), her mom, siblings and other family members. I was disturbed and disgusted while watching the program. It is great that she is in a position to help the ones she loves but she appears to be surrounded by some professional leaches. One of the ingrates is her 28 year old brother Teeny. Teeny is unemployed and loving it. He doesn't want to do much of anything except spend Fantasias money and test drive Ferraris. He doesn't want to go to school or get a job. He claims that music is his passion but at least in episode 1 he didn’t even do anything related to music. Shot turn on the radio, pretending your mixing a beat so something….. he appears to be a lazy jerk. He even began tearing up the interior of Fantasia’s pool house in an attempt to create a cozy recording studio for himself, of course all on Fantasia’s dime. The mother really gets under my skin because she is an enabler, not scolding the brother for basically taking advantage of his sister. Of course her family members will probably not find jobs that will pay enough to take care of all of the household expenses, but at the very least they could get jobs to take care of themselves or to buy groceries for the household etc. If my sister had a boat load of cash and I lived with her there is no way I could sit back and allow her to do and pay for everything even though she would probably want too. I would want to open a business and bring in more income or keep a job and help our where I could. Even if your monetary income isn’t equal to a wealthier family member at the very least they will appreciate your attempt to help and you can feel good about yourself too. I do not, nor will I even understand lazy people who try to live off of others, the sense of entitlement sickens me. How can you be a big grown man looking in your little sister’s face every time you need some money…GROW up. I honestly don’t know at this point if I will be able to get through this series simply because I hate to see lazy people take advantage of others…it disturbs me deeply. What are your thoughts? Did you hear Fantasia’s cutie pie daughter belt out that note? I see a little diva star in the making…..
Let's Talk about Pep is a show where four friends gather to discuss their experiences with dating. Each woman seems interested in love but they all have different agendas. Pepa, a mom of two, has been married in the past but after failed relationships, she is ready to get back on the saddle and find her true love. Jacque, the reporter/ radio host wants it all, the husband and the baby but since that biological clock is tick tick tocking away she may consider having the baby and finding the love of her life later. Jomana, a sports journalist and recent divorcee from an NBA star, is going to experience the thrills of dating for the first time since her 11 year marriage ended. And finally we have Kitta, a wild child looking to have a good time while leaving a string of hearts in the distance. These women basically discussed their dates over lunch. Pepa went out with an NFL star, I want to say former NFL star since he seemed to be up there in age. I don't watch football so I don't know him...anyone out there familiar with the gentleman shown on last night's date? Well the most eventful part of Peps night out was the fact that her NFL baller date's hair nearly caught on fire due to his modern day jherri curl. Pep heard a sizzle and smoke began to come rise from his curly tendrils ..lol. Kittie thought she had a boring business man on her hands and she was not interested, that is until he told her that her toes tasted like meatloaf...(don't ask) but I assure you, it was gross. Kittie makes way too many facial expressions for me, at least while she was at that date she had all of these weird faces she would make at the guy. I know he may not have been her type INITIALLY but she could have been a little nicer. She only warmed up after she realized he has a freaky side. Jomana did not have a dating experience this week so that leave us with my girl Jacque. She went out with Lammar the actor who played Jill Scott's second husband in the Tyler Perry movie, Why Did I Get Married. Lammar and Jacque have been friends for quite some time though they never dated they have "love for one another". He said he would be open to a conversation with Jacque when she asked if he would give her his sperm to allow her to have the baby she desires. I have a question to you ladies out there...is walking a woman to her car or front door no longer an option for men? I saw Jacque walk off into the night as big strong Lammar strolled down the street in the opposite direction. Perhaps her car was right there, I dunno and they are just friends but still...dang. Kittie exited the car and walked herself to her front door, I'm like wow I guess I'm just old fashioned! What do you think of the show? Will you tune in again? As you probably all know by now, I am not a huge fan of applying oils on my hair simply because I dislike greasy hair. However, everyone on the Internet seems to be thrilled when they use castor oil on their scalps to promote hair growth. I think I am seriously going to give it a try, I've done it a few times but not on a consistent basis so let's see how it goes. As you can see this bottle is almost done because castor oil has many many uses. How do you use your castor oil? Have you seen significant growth after applying castor oil to your scalp? Forget about everything else that disturbed me during the insanity that was The Jersey Shore episode last Thursday, and let's focus on a few things that really grind my gears. 1) When a woman has a big mouth and thinks it's cute to get her muscle bound man in scuffles. -When some drunk guy was antagonizing Ronnie, Sam just had to get her two cents in by making a few rude comments herself. Ronnie was trying to ignore the drunk guy and he repeatedly asked Sam to stop communicating with the drunkard who clearly wanted a fight. Eventually, it happened, the two men began to fight and I do think Sam caused the situation to escalate. I also think she used the "push" as a way to get Ronnie to forget about her actions and instead feel sympathetic towards her. * I applaud Ronnie for understanding that a 20 something year old man fighting in public (if he's not a professional boxer) is so LAME. Men need not attempt to prove their manhood by boxing it out on a street corner with every loser who wants to pick a fight. What if the cameras were not there and the drunk guy had a weapon...geesh when will some women learn- watching your man knuckle up for over stupid issues should not make you feel all warm and fuzzy inside. By now you may have heard about the KFC commercial that many people claimed was a racist advertisement. In the commercial you have a group of black people rooting for their cricket team and one man from the opposing team sitting in the crowd. The man appears to be nervous and agitated as the voice says something like "caught in an awkward situation?" then he whips out a bucket of chicken and of course all the black people dig in. The man says "too easy". Now there were many opinions that I found online where some people thought there was nothing wrong with the commercial and people need not be so sensitive. On the other hand, you had those who were deeply offended by the ad. I completely understand the team rivalry that exists between different cricket teams...got it, but what I don't get is the commercial for the following reasons. 1)The Australian guy is squirming around as if he is going to be attacked. I didn't understand why he appeared nervous in the commercial because no one was paying attention to him. Literally, they are not even looking his way so how was that an awkward moment????? It would have been more effective if he was perhaps rooting for his team and then everyone else looked at him, then you could say "caught in an awkward situation", but you cant ask that question when people appear to be happy and they are ignoring him...how was it awkward I ask? 2) If he had taken some chicken himself perhaps it would have looked a little better, but the fact that he holds up the bucket and every black person present jumps in for a piece disturbs me especially as he utters his final words ="Too Easy". KFC has since removed the commercial but that commercial must have gone through countless boardrooms before hitting the air waves so I am left wondering #whoapprovedthis ? I actually have friends of all backgrounds and I am not overly sensitive in my estimation but this commercial didn't sit well with me when I first saw it. What are your thoughts? If you want to see the commercial click here. Shescentit review, a Youtube Contest, They're Back and Pepa & Jacque? 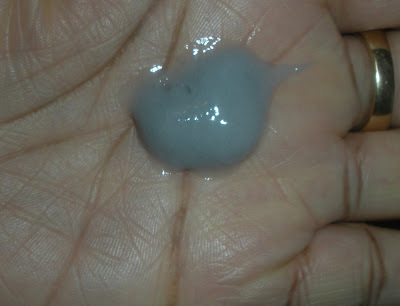 Below is a video review of the SheScentit coco creme leave in conditioner. I like this product! I also show my little Afroveda haul. I hope you have a great Friday and weekend. Rosalyn scents is giving you an opportunity to win prizes and get your Youtube fame on! If you enter her contest, which requires you to post a video showcasing your personality, you will win a Rosalyn Scents goodie bag and your video will be featured on her youtube channel. For more details click here. Many of us may remember watching Martin each week as he juggled his relationship with his wife Gina and close friends on the hit show Martin. If you have waited patiently to see if Martin Lawrence would return to the small screen, you don't have to wait any longer- he's backkkkkkkk. This time around he is working in a different capacity, serving as the executive producer of a new tv series, "Love That Girl", staring another person who has been missing from the small screen, Tatiana Ali! We all remember her as Ashley Banks from the Fresh Prince of Bel Air, don't we? Well this now 30 something (time flies) Harvard educated, entrepreneur will be back to work on our tv screens this month. She is going to play a divorced woman who is putting her life back on track as her brother comes to live with her...I suppose comedy will ensue. Having Martin as the executive producer is sure to round up a few laughs. I can't wait to get my giggle on, on January 19th on TVOne the fun begins. The show will air for three consecutive nights and then it will continue on every Tuesday. I am DEFINITELY watching, but will you check it out? Do you have the station TV One? Can't wait until January 19th? Well you can catch Tatiana Ali on HER show Buppies, a web series that will only appear on the BET website. On the show, Buppies (black yuppies) deal with everyday issues all while living posh lifestyles. Tatiana is the executive producer and this project is from her entertainment company which she runs with her sister. I remember watching Jacque Reed as a youngster as she reported the latest news on BET. She began her work there after Tavis Smiley was released (what a sad day that way for me). I have a love hate relationship with oils, they are just too oily. I don't want to leave my fingerprints on everything I touch but at the same time I love all of the shiny goodness left on my skin after I apply an oil. I decided to purchase the After Bath oil from Oyinhandmade during their Black Friday sale for a mere $12.00 (a larger size is also available). This oil can be used from head to toe so I decided to actually use it on my hair and body. Well well well, thank you Oyin for giving me just the type of oil that I need in my life. This oil works better on my hair to lock in moisture than probably any other oil that I have used. I like it mainly because it doesn't weigh my hair down like some of the heavier oils that I've used in the past. I should also note that I use very little at a time when sealing in moisture because I hate a greasy heavy head of hair. While I am still not fully on the moisturize and seal bandwagon, when I do seal in moisture this is the product that I turn to. I also love the fact that this oil is available in a variety of scents, I selected coco mango. I mentioned on one of my videos that the coco mango scent really does smell like a fruity mixture of coconuts and mangos (emphasis is placed more on the mango/ fruity scent as opposed to a strong coconut scent). For my body this oil absorbs as well as coconut oil, maybe a little better so that works out well for me too! I feel like the oil absorbs well but that generally translates into the fact that I need to apply more if I want to maintain my shiny glow that you all know I love. I would totally get this product again, in fact I am going to upgrade and get the largest bottle possible. Some of the ingredients include - rice bran oil, walnut oil, coconut oil, vitamin E, sweet almond oil and black seed oil. Have you tried this after bath oil? Which oils rock your boat? Do you seal your hair after moisturizing? This morning I was listening to the radio (Power 105- don't judge me lol) I normally don't tune into this station but the topic caught my attention. They started talking about relationships and the role that a woman should play in a relationship. Things have changed and many women today whether they like it or not have to work to support themselves. Certainly some women LOVE their jobs and they embrace working outside of the home, however I do recognize that not all women share this passion, but I digress. A guy called into the station and said the reason why many educated women are single is because they don't take care of the home anymore. He said that we have moved away from the cooking that we used to do back in the day. The female radio host gave him a brief snippet of her day just to detail the hours she works and how tired she is at times. She said although she loves to cook she is sometimes just too pooped. When Malika, the female host, suggested the gentleman pick up a pot or pan on occasion you would think she had asked each living man to shoot himself in the foot. Malika- The women that cooked all the time and did everything were very often able to do it all because they didn't have to work outside of the home. Why can't men today help with the cooking etc. Male Caller #1- Because we have our own role in the household and it's not cooking etc. Malika- Well then if our role in this day and age in this economy is to cook, clean and take care of the kids and financially contribute to the household please tell me what is the role of the man? Male caller #1-We have our things to do like taking care of "KNICK KNACKS"
Ed Lover- We take out the trash, put doors up and fix things. Male caller #2-"Women need to get back to "popping string beans instead of opening canned foods. " Female caller- Maybe I don't have knick knacks that need to be fixed so maybe I need help with the cooking, or the kids- it's a partnership. We need to do whatever we need to do to make that relationship and the household work. If you are the man and you get home first start cooking, just like I will start cooking if I get home first. Ed Lover- I dont know what kind of man would do that, I get home at 3 every day and I'm not cooking. I cook on occasion, a man can help sometimes but really that's on the woman. Male caller #4-"Malika is showing you what's wrong, these educated women today are too combative too argumentative." I was giving this whole conversation the side eye but what is the role of the man and woman in your opinion? If you recall, "Product Watch" is the segment where I tell you which products I have my eye on. I had heard rumblings of a new gel nail polish that hit the market but I have yet to feast my eyes upon this product. Thankfully Amazon has the OPI Axxium gel nail polish in stock for $18.00 so I think I am going to purchase one. If you order the entire kit, you will be paying $135.00- yes for nail polish. My co-worker went to a nail salon where the gel polish was applied and she said that after a week on her nails she doesn't have a chip in sight. The gels are also supposed to keep your real nails strong and shiny so let's see what happens. IBD is another company that sells the coveted gel polish but it is much cheaper at $8.00 per jar. Have you tried gel polishes from either company? If so please share your experience. Bliss got my $18 with this oh so ordinary body wash, but they won't get me again. I purchased the 16 oz lemon sage body wash because the bottle explained that I was getting more for my buck and that the product is really sudsy...ok Im easy to please..lol. The scent gives you a hint of lemon but then that sage comes right around to punch me in the nose. I don't care for the scent and the body wash is not super sudsy, it's a regular old body wash and in my book not worth $18.00. I should note that this sulfate body wash (sulfates are common in body washes) is paraben FREE and includes aloe vera juice. Of course Bliss slipped in some blue dyes and other chemicals to round out their ingredient list. So yup this is another product for the SKIP IT files. I have tried other things from Bliss but in general this company does not impress me. Nevertheless I plan on hitting up the Bliss spa this summer in NYC. Is there anything from the Bliss line that I need to check out??? 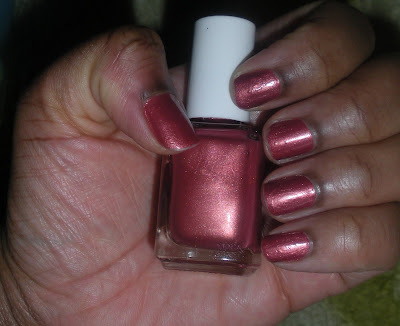 Nail Check Antique Rose by Essie is the color that I am wearing in this picture. In person the color really looks like rose gold, so I like it. Ignore my sloppy application please..lol. This bottle costs roughly $8.00. There are two segments that I LOVE from Essence.com- 1) The annual - Will You Marry Me? videos where men propose to their lovely ladies on camera. We get to vote for the pair we love and the couple with the most votes will win a wedding package which usually includes a great honeymoon and other treats. The second segment that I love is 2) 30 Dates in 30 Days which Essence only ran once- If anyone from Essence is reading this post (doubtful lol) PLEASE bring back this segment, it was oh so enjoyable. Essence would take women and fix them up with bachelors and show the dates online. The viewing audience would vote and select each date for the women. The women also had an opportunity to be styled before each date so that each woman would look fierce from head to toe! Who Wants to Work For Diddy? Well I know I certainly don't want the position but clearly there are many out there clamoring to be Diddy's assistant. Last night the final battle was fought between Ebony and Dan. They battled task for task in an attempt to outshine each other and impress Diddy. Diddy had them perform a myriad of tasks throughout the day to see how competent they were and to assess their flexibility,and overall potential. Both contestants had their shortcomings and showed that they would both require refinement before being thrust into the thick of things at Bad Boy, but in the end Ebony prevailed. Much to my surprise Dan was sent packing, I really thought he would take the crown as Diddy's new assistant. I didn't expect to feel this way at the end but after watching the final episode and looking at the areas where Ebony fell short, I really thought she was going home jobless. While Dan certainly doesn't know everything he does have a certain level of general office etiquette which can not be taught easily. For example when Ebony decided to stroll around the Bad Boy office without shoes I was appalled. First of all you know that the final challenge will require you to run your bones all over NYC so why appear in heals and a pencil skirt?????? So when her feet could no longer stand up to the pressure, those shoes hit the bricks and she kept it moving. Dragging her bare toes across the floor grrrrrrrrr. Imagine if an important client or better yet DIDDY caught you walking around like that (he did by the way and wasn't pleased) that in my book is a common sense NO NO. Also Diddy gave her a simple test which I thought she would breeze through but again I was wrong. He gave her a list of names (first and last) and asked her to get the people on the phone on his behalf. However, before allowing this contestant to waltz out the door he asked her what she would say on the phone. One person on the list was Tracy Edmonds (the ex wife of Babyface) and Ebony said I would say " Hello can I speak to Tracy". I wanted to reach through the tv and grab Ebony. Of course Puff grilled her and told her that executives shouldn't be addressed by their first names etc. Did she think she was calling her bff? Gee whiz. Anyway congrats to Ebony. Perhaps she was just nervous during the final challenge, but I think she has a great deal of potential and I wish her the best. Washing my hair with grapefruits? When I think of natural ingredients that will nurture my tresses and make my hair look amazing, grapefruit is probably the last item that would come to mind. Well I'm thankful that Verikira had enough foresight to include this delicious ingredient in their shampoo and conditioner. I had no idea how my hair would react to these sulfate and paraben free products, but it turns out that my hair LOVES them. When I used the shampoo I was initially concerned because my hair had very little slip, I would not have felt comfortable running a comb through my hair at that point. However, after washing that shampoo out, my hair was totally clean and the oil that I used in my pre poo had been taken away. It almost felt as if I had clarified my hair. Once I added the conditioner my hair was transformed into soft silky strands. It was after the conditioner application when I felt that I could freely pass a comb through my wet hair if I decided to do so. As usual, I allowed my hair to air dry and I was surprised with the level of shine that was revealed, just beautiful. I should also note that to my surprise, the product did not smell like a grapefruit peel, instead if has a light grapefruit scent that is anything but overwhelming. I actually liked the scent of this citrus filled product. Although the shampoo has a light pink color, the conditioner is a light shade of gray as shown in the picture on the left. Ingredients include MSM (sulfur) which is great for encouraging hair growth, pink grapefruit essential oil, organic aloe juice, panthenol, organic green tea, wheat protein and other goodies. The shampoo is priced at $28.00 and the conditioner is sold for $32.00. 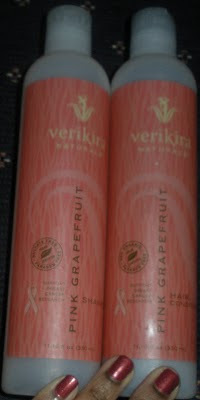 You can make this purchase or search through the other natural products from Verikira by clicking this link. Have you tried anything from this company? * I neglected to include the footage of the shiny hair I was left with so I will include that later! When a person has beautiful even toned skin, it generally becomes the topic of conversation. We just can't help but acknowledge it as we try to figure out what we need to do to get it. At least in my book beautiful skin trumps makeup any day of the week. 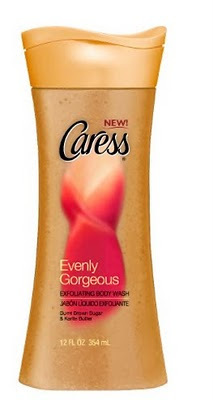 I was eager to try the Evenly Gorgeous Exfoliating body wash and the Evenly Gorgeous body bar from Caress since it claims to help you unveil smooth even toned skin. This product has burnt brown sugar which is supposed to gently exfoliate your skin. You can actually see the tiny brown pellets floating through the body wash. Although you will certainly feel the little sugar granules rubbing against your skin, they are not abrasive enough to irritate your delicate skin. Shea butter or karite butter as it is labeled on the bottle, is also included in the formula to keep your skin moisturized. The scent is delightful, it smells like warm brown sugar with a touch of perfume. If you are not a fan of body washes, this product is also available in a solid bar form. Each bar contains the same tiny granules that you would find in the liquid version of this product. Unfortunately, I didn't unveil eye catching even toned skin, perhaps more bottles are needed for that to happen but my skin was feeling rather smooth and silky. For my fellow ingredient junkies I would be remiss if I didn't tell you that three dyes are included in this sls body wash, but this paraben free solution also includes yummy molasses! Have you tried this product? What are your findings? *I received this bottle of body wash and solid bar soap from Caress- thanks.